The same can be said of every other cartel plundering the nation: healthcare (i.e. sickcare, because profits swell from managing chronic illness, not from advancing health); the Big Pharma cartel; the military-industrial complex; banking; student loans; the governance-lobbying cartels; the war-on-drugs gulag, the FBI and so on in an endless profusion of insiders whose self-serving plunder and gross incompetence rarely generates consequences (such as being fired or indicted) due to an absence of accountability and transparency. Incompetence has been institutionalized, and is now the accepted norm.Schools fail, municipal agencies fail, oversight agencies fail, state agencies fail, and the public feels powerless to effect any systemic change. Changing the elected officials who are the citizens' representatives does nothing to rid the system of incompetence or enforce accountability and transparency; the insider elites have wired the system to avoid responsibility and maintain their institutionalized skims regardless of who is in elected office. 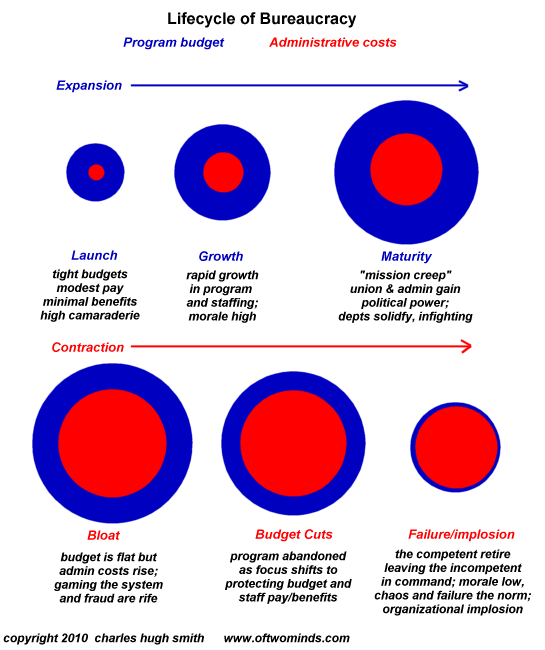 Budgets never decline, they only expand. The system is organized to punish frugality and reward incompetence, sweetheart contracts, overtime, and ever higher public spending. Calls to trim waste are met by gestures of powerlessness: rising costs and institutional failure are presented as the equivalent of gravity: we can't change the system, it's unstoppable. The general public has largely lost the experience of public-sector/institutional competence and accountability. As a result, resignation is now the response. So the public dutifully waits in line for hours to renew a drivers license, despite having made an appointment online, to take one common example in California, which likes to pat itself on the back as the tech / progressive capital of the galaxy, if not the universe. How is it "progressive" to rob the working stiffs who pay all the taxes hours of their life for something that should be routine and quick? Where's the Big Data and high tech when it actually counts? If citizens had a choice to renew their drivers license at (say) Amazon or the DMV, do you reckon Amazon might not make everyone cool their heels for hours? The list of gross institutional incompetence is truly endless in America:Universities that can't offer enough classes so students can graduate from college in four years (oops, you have to pay another rip-off tuition fee for another semester to get those last few classes you need for your worthless diploma); finance departments that can't track payments (so here's your bogus late fees that will take hours to challenge), and on and on. As for sickcare--how about the evidence-free embrace of synthetic heroin as a "safe" and "non-addictive" pain treatment? Skeptics were bulldozed or marginalized, because there was simply too much money to be made by jumping on the Oxy et al. bandwagon. As Scientific American reported in its June 2018 issue, "Powerful drug-marketing efforts had somehow swamped science." When a large study was finally done comparing the effectiveness of opioid and non-opioid drugs, "The results, published in March, were eye-opening. Patients given alternative drugs did just as well as those taking opioids in terms of how much pain interfered with their everyday life. In fact they reported slightly less pain and had fewer side effects." Yes, many transactions are more complex now than they were 30 years ago.30 years ago it took less than a day to obtain a building permit for an entire house in the rural county I lived in. Now it takes 3 to 4 months in the same county to get a permit, which must now be stamped by a licensed architect or engineer (at great expense, of course). OK, we get it-- things are more complex now. But how does a one-day process balloon into a 100-day process at best? We can understand a one-day process becoming a 3 day process, but did the complexity really rise 100-fold? I think we all know the answer is "no." The vast majority of the wasted time, effort and cost is the result of unaccountable insider incompetence enabled by a complete lack of accountability and transparency. Conscientious public servants and institutional insiders are thwarted by incompetent managers, lazy co-workers and institutional bloat designed to increase costs and inefficiencies because higher budgets and inefficiencies boost payrolls and thus power. Organizations within the failing institutions are loathe to surrender their gravy trains, so they resist any change, even those which might have saved the institution from its inevitable collapse. Our institutional failure reminds me of the phantom legions of Rome's final days. Legions existed in the bureaucracy, and payrolls were sent to the pay masters, but the Legions were mere fictions--there were no soldiers, and no fighting force; there were only a few insiders skimming their take, confident that accountability and transparency had been irrevocably lost. Systems fail one institution at a time. No wonder the super-wealthy are building bunkers. Thank you, Jim K. ($5/month), for your splendidly generous pledge to this site -- I am greatly honored by your support and readership.